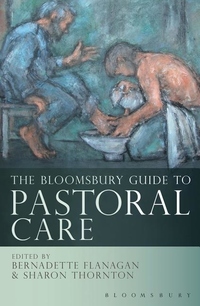 The Bloomsbury Guide to Pastoral Care provides a framework for reflection on pastoral care practice and identifies frontier learning from the new and challenging practical contexts which are important in pastoral care research today. In this collection of essays from leading practitioner-scholars, Bernadette Flanagan and Sharon Thornton set out core principles underpinning professional identity and the practice of pastoral care in rapidly changing social settings. Such pastoral challenges as, developing compassionate and effective companioning to those who have suffered trauma, torture, catastrophic events, social disintegration, the moral wounds of war and cultural dislocation are treated with insight and deep care. The new frontiers of pastoral care in more familiar circumstances such as family, health settings where patients facing life-challenging medical events and multi-cultural communities are also explored. With contributions from Kevin Egan, Michael O'Sullivan SJ, Rita Nakashima Brock and Julia Prinz VDMF, The Bloomsbury Guide to Pastoral Care is an essential reference for the theory and practice of pastoral care.